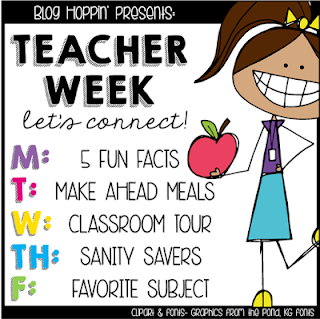 Teacher Tips and Tidbits: Teacher Week - WEDNESDAY - Classroom Tour! 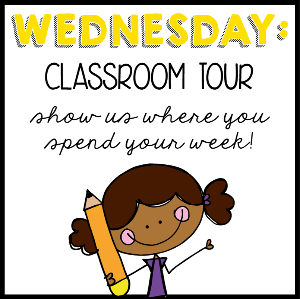 Teacher Week - WEDNESDAY - Classroom Tour! It's a Teacher Week Blog Hop! Happy Teacher Week! I love teachers. You can always tell when someone is a teacher. You just know. Whether it's how they dress, what they say, or how they function...if you're a teacher, you just can't hide it! Here's to celebrating teachers! What better way to get a glimpse into the life of a teacher than to take a peek at the four walls she lives inside for the better part of the year. Katy here! Welcome to my 3rd grade classroom! I snapped a few quick photos with my phone after the 3rd day of 3rd grade to give you a glimpse into my world. Here's the corner you see first when you walk into my room. Don't you love that classrooms can be a work in progress? I love that my classroom changes with my students. For example, this bulletin board is already different. This very important corner houses our two student desktops, our clipboards, our book boxes, and the Homework Hotspot, inspired by Young Teacher Love (yay Michigan teachers!!). Also, I love that random outlet right up there by the top corner of my whiteboard. No, seriously. It seems so out of place, yet it opens up so many possibilities! Someday, I want a neon sign to hang on the wall and plug into that outlet! What should it say? Maybe something like "READ" or "YOU'RE LOVED" or "TRY IT." What would you put on a neon sign in your classroom? Here's the opposite wall. You can see our classroom library, waiting patiently for categorized, color-coded and labeled baskets. I have our classroom non-negotiables posted on the wall. Many thanks to Joanne Miller for those! There's an anchor chart on the extra desks, waiting to be hung. The short blue shelf in the back will hold math manipulatives. But my favorite space in this area is the chalkboard! The chalkboard is my favorite because of how we use it to reveal student thinking. We use a thinking routine called "Chalk Talk" from Ron Ritchhart. I bought some chalk markers off Amazon. Then, I used the markers to write three questions in thought bubbles on the chalkboard (shown here in red). Students respond to the questions throughout the week, and then respond to the responses, until the board is completely filled with thinking. It looks amazing in the classroom and I love that it gives every student a voice. Through this blurry picture, you can hopefully make out my small group instruction table. I also tend to use this space during my planning time for grading and of course! planning. This wall features our growth mindset posters from Angela Watson, and our brag tags (we call them glad tags) from Jamie at Diary of a Not So Wimpy Teacher. If the chalkboard wasn't my favorite part of my classroom, THIS might be the favorite part. I adapted Molly's door decor to fit the skinny wall next to our door. It is colorful, full of truth, and so encouraging. I love this daily reminder of what's important in our class. Thanks for taking a peek into my 3rd grade classroom!